This is a 2009 World Cat 270 Sport Deck powered by twin Suzuki DF225 Four Strokes with only 230 hours, warranty until 2016, and includes a trailer!! This might be the most versatile 27ft boat on the water. A Dual Console with comfortable seating for 12+ and lots of storage. 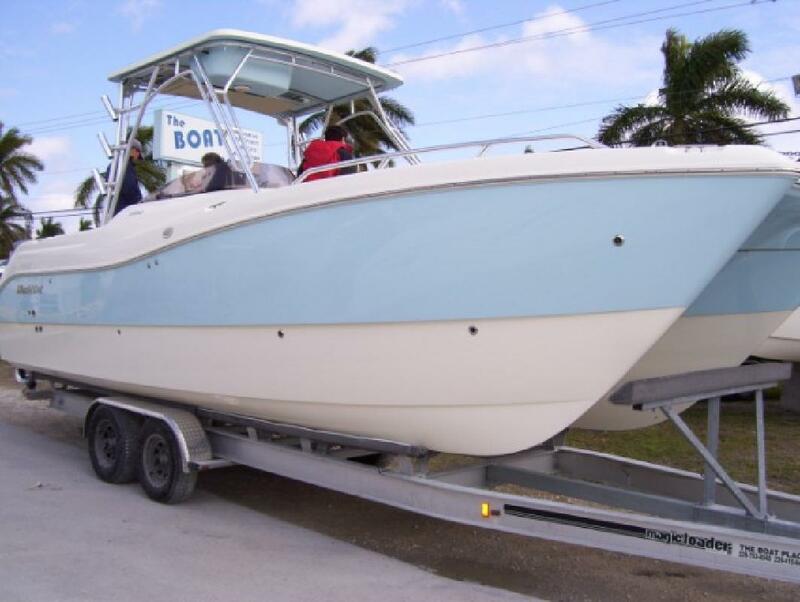 It makes an excellent family island hopping boat or with its Semi-Displacement Cat hull and all the fishing amenities, it makes a top choice for offshore, nearshore or inshore fishing. I have had this boat for about 1 18 months and have done everything under the sun in it. I bought it as a NEW left over in March of 2010. We have had a number of banner days fishing the blue water of the Gulf Stream for Dolphin and other pelagics. The large fish boxes were slammed! With excellent fuel efficiency and a 200 gallon fuel tank, it has made countless trips out in the Gulf of Mexico as far as 125 miles to do some Grouper and Snapper digging. The twin 225 HP Suzuki four strokes handled beautifully. On other days when we desired to fish closer to home, we have caught our limit of Trout, and Redfish in the grass flats as this vessel only drafts 18in (with a normal load). In addition, our family has had countless days of island hopping, cruising and just plain relaxing on the water. The enclosed head is perfect for women and the kids and there is more than enough storage for all the gear you could possible want to bring. This Cat rides like a much larger boat but is incredibly efficient as well. At cruise, I have seen as good as 2.3 MPG and typically see 1.8-2.0 when loaded for offshore fishing. Normal cruise speeds are between 28-32 MPH and WOT is about 50+ mph. -Additional 110 quart insulated fish box under the molded in guest seating mid ship. -Windless with 15ft of chain and 600ft of rode. -and way too much more to list. The boat also has a 10 year transferable structural hull warrantee and has been serviced regularly (most recently July 2011) and has all the records. The boat is in excellent shape!